My approach to reading bothers me. I’m not certain whether it amounts to a lack of focus, a sense of boredom (upon a single topic) or the over-excited edge of wanting to read everything and now. I can’t simply read one book. I apparently have to read ten at the same time. And that’s just the ten I happen to have recorded in GoodReads.com at this moment in time. I might not actually be reading precisely those ten books. It could well be that I’m reading a slightly different ten books. I just haven’t had the chance to update the current list. I suppose another possibility in respect of the breadth of reading could be location. I like to have books scattered around the house and whatever I happen to be nearest to will get read. For example, I don’t have 2000AD included in the reading, but I do generally read it when I’m in the kitchen having breakfast first thing. When I don’t have a current issue to read, my fallback will be to my current preferred e-read. I don’t have Maelstrom Domesday on the list. That’s sitting in the lounge next to my normal seat, with a few other random bits and pieces. I started work on a draft of a Maelstrom Sci-Fi game a couple of years ago, running to 14,000 words in the first draft – which Alexander Scott himself had a glance over to provide some feedback. However, the current toolkit aligns to the original paperback edition rules of Maelstrom, rather than Domesday more detailed lifepath approach. Oh, there are DC, Image and Marvel comics in the downstairs loo. And SFX. Sometimes reading about work stuff simply seems like a bit too much effort, so I have something lighter to fall back on. Anyway – all this diversity of reading material seems to help me continue reading, but it does splinter the sense of progress. And sometimes I give in to the urge to add something else. When I add a new book to the list, something else always seems to suffer. So, my reading of the Dungeon Master’s Guide and GLADIO have both slowed to an almost standstill, despite the fact I’m enjoying both. Instead, I have been reading the preview copy of the Cypher System (for a review on Geek Native) and started reading A Slight Trick of the Mind (on the recommendation of a friend). 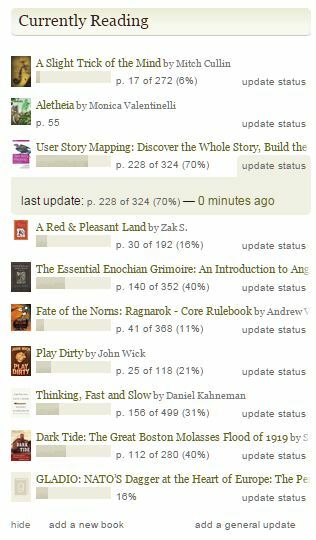 At some point later this year I will have the opportunity to update GoodReads and catch up with my reading target by about ten or eleven books all in one go. I’m still going to be behind. However, I am trying. And I am reading.